Take the sausages out of their skins and put the meat into a bowl. Dust your surface or a chopping board with plain flour, then roll out the pastry to about the thickness of a one pound coin. If you don’t have a rolling pin, use a bottle of wine. Cut the pastry into two or three widthways (or really however you want – this bit isn’t complicated, you just need to roll sausage meat in pastry). Squidge sausage meat generously down the lengths then roll the pastry around it with about 2-3cm overlap. Do the same with the other bits until all the pastry and sausage has been used up. I made two big ones, and two mini ones with leftover bits and bobs. It looks fancier to make big ones, but it can be unwieldy when trying to maneouvre them. Lightly beat the egg then paint it over the top of the pastry . Put the rolls into the preheated oven for 25 minutes. They should be golden by then but bigger rolls might have a soggy bottom, so flip your larger rolls upside down (leave smaller ones as is) and cook for another 10 minutes – 35 mins in total should do it. I’m calling it! This is the ultimate posh sausage roll recipe. I had some apricots in my baking cupboard, I had an inspiration, and this is the result. Preheat the oven to 180C. Chop the spring onions into very small pieces, then fry them up slowly and gently in generous amounts of olive oil in a frying pan. When they’re nearly cooked (which always takes much longer than any cookbook will have you believe), crush the garlic in the crusher and add that in. Cook the garlic very gently too, so that it doesn’t burn. Add the chopped pancetta in with the oniony garlic mixture and fry it up until cooked. I’m normally an enormous fan of crispy bacon, but this is not the time for that. Don’t overcook it. Keep stirring it until it’s cooked and all the delicious bacony juices have come out into the pan then been sucked right back up again. Put this mixture into a large mixing bowl. Chop your apricots into little bits, pull the leaves off the thyme, chop them with a massive and wonderfully sharp knife to pretend you’re a proper chef, then add them to the mixing bowl. Don’t be precious about amounts. If you have some extra bits and bobs hanging around, chuck them in. Chop the parsley finely, and add that to the mix. 5. Slice the skins of the sausages with a sharp knife and put the meat into the mixing bowl too. Zest the lemon (ideally on a microplane, those brilliant tools you get in Lakeland) and add that in. Then put the lemon in the fridge and you can have it tomorrow morning squeezed into some warm water – very good for you. Season it very generously with shedloads of Maldon sea salt, and freshly ground black pepper. Grate in some fresh nutmeg too. Not silly amounts, but a good few grates. One thing I’ve learnt from chefs is to overseason, and then add some more – particularly if it’s lovely Maldon. Never use table salt, it’s far too harsh and will then taste like salt rather than just bringing out all the flavours. 8. Get your hands stuck in – much easier and more thorough than a spoon. Squidge the sausage meat with all the delicious additions and squidge and squidge and squidge until it’s all combined. Put that aside. You could always make that in advance if you wished, then just take it out of the fridge half an hour before your guests arrive and build the sausage rolls. Make the sausage rolls! For my last batch I divided each of the two ready-roll sheets in two (splitting the rectangle in two down the middle so it makes two sort-of squares) and squidged the meat mix out into four long sausages. Alternatively, you could make loads of mini ones. Put your meat along beside one edge, and roll it up tightly like when you were little and you’d roll your little sister up in a rug and make her into a sausage roll (I was the little sister). Crack the egg into a little ramekin and mix it up with a fork. Get a pastry brush ready (the plastic/silicone ones are best because they clean easier). When you’ve rolled the sausage up in its pastry jacket, brush egg along the inside of the pastry then stick it down. Leave it open at the end so that it goes a bit crispy and then you get some extra pastry to snack on too. Spread some silicone/greaseproof paper on a large baking sheet then put the sausage rolls on. You may only be able to fit two on – it’s nice for them to have a bit of space so that the pastry can puff up. Paint the whole of the sausage roll with the egg. Pop it in the oven for 20 mins, then check it, turn it around and do it for another 15-20. Chop it into large bits, and serve it on a wooden board and pretend you run a hipster coffee shop in Stoke Newington. If you’re short on time, these are fast and impressive, and excellent with champagne. Do I sound like Pippa Middleton yet? The basic concept is that you buy some ready-rolled puff pastry (really, honestly, never bother making your own. You could buy the packs that you have to roll out yourself but as they’re pretty much the same price, there’s really no point other than rolling pastry out is quite fun), spread fillings out on top of it, and then roll it cleverly. Look – someone’s even done a handy picture for you (credit: Epicurious). Basically, fold each side in, to meet in the middle. Then do it again. Then fold that in half. When you’ve made your fatty pastry roll, filled with delicious things, cut it into skinnier bits about 1-1.5cm wide. Spread those out onto a baking tray with baking paper on top, cut-size up, then cling that and put it in the fridge for 30 mins (warm pastry will not puff up in the oven). Then, brush them with a beaten egg and cook at 200C for 10-15 minutes until the cheese has melted and they’re golden brown. Distribute into bowls around the room. I once had a drinks party where I served little bowls of roast potatoes and they went down brilliantly. Don’t even bother with cocktail sticks, because it’s a pain being stuck with one in your hand. I think that it’s best to cut the potatoes really small, so that you get maximum crispiness. Lots of potatoes. Say, 1kg. If you can, go for new potatoes or Maris Piper. Peel the potatoes (unless they’re new potatoes, in which case do not bother), and cut them up small – small enough to be eaten in one bite. Put them in a pan of salted (don’t be shy with the salt – and use Maldon as the taste is softer) boiling water until they’re completely cooked and a knife slips straight through (I like them slightly overcooked because of the next stage…). Preheat the oven to 220C. Put them into a colander and shake shake shake until the bashing together means that the edges start to go all fluffy. Meanwhile, put a big baking tray into the oven with a few generous glugs of olive oil. After 2 minutes, then put your bashed up little potatoes into the hot oil, shake it around, make sure that all the potatoes are covered but not drowned in oil and sprinkle lots of Maldon sea salt and a bit of cayenne pepper over them (and all in a single layer). Put them into the oven for 15 minutes to start, then give them a toss and a turn over, then 15 minutes more, until they’re really crispy and golden. Scatter with more Maldon sea salt, then serve them in bowls on every available sideboard. One of my favourite interviews I’ve done for The Times was with the amazing Cleo Rocos, who I’m very happy to say has become a friend. Happy because she’s the most joyful (or gleeful, as she would say) person I’ve ever met. You can’t fail to be happy around Cleo. For anyone who doesn’t know who Cleo is, firstly, shame on you. Secondly – she was Kenny Everett’s sidekick on the Kenny Everett show, was on Celebrity Big Brother at one point, and now makes a hangover-free tequila. I’m not lying – I’ve had a night of 12 margaritas with Cleo, and we were both SO HAPPY and excitable rather than woozy drunk, and I had not a sniff of a hangover since. 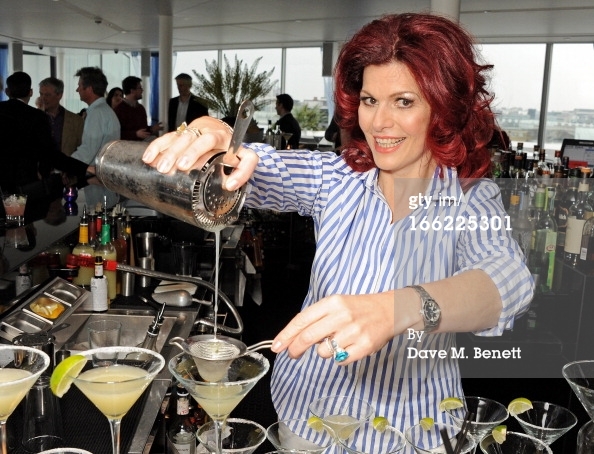 I’ve tried the margarita experiment several times since with her tequila (Aquariva – it’s all natural), and it works every time. So if someone knows her parties, Cleo knows her parties. The venue isn’t always terribly important. But do make sure that as soon as people walk into the room, they know that it’s a party. I get those cheap thin ribbons for present-wrapping, in ice blue, cream, silver or red, and curl them slightly with scissors and drape them over all the picture frames and all the lamps and it just says party. The quality of outfits is important. People should be their favourite, most celebratory version of themselves for the night. Everyone has something in their cupboard that they ‘never get the chance to wear’. Well, just wear it! Always feed people/serve food that serves a purpose. Don’t do anything pretentious. I hate being served those pretty, flimsy little things with a dangly that, wrapped in a bit of that – yes, it looks pretty, but it’s not going to fill you up. At a party, sometimes I even make it as simple as dismantling a roast meal for a standing-up affair. I will simply make enormous platters of beautifully crisped roast potatoes, or delicious glazed roast parsnips, or even a plate of lovely roast beef, mini sausages or meatballs – anything that is easy to pick up in one hand, or stab with a cocktail stick with a glass in one hand, and it just goes in the stomach and lines it for all the drink that will follow – and it just tastes divine. Don’t interrupt your hostess if she’s still getting ready. As the hostess, and people come into your room to chat to you, just say to them Oh hello, how fabulous to see you! Would you be marvellous and pop downstairs and check that all the guests are ok? Or ask that she should check what’s happening with the oven. Make them feel important, and crucially, get rid of them while you’re putting yourself together. Arrive no more than 15 minutes late. A good host should detail the timings of the party: cocktails from 6pm, dinner will be served at 8pm. A perfectly-behaved guest would arrive between 6 and 6.15. Drink until the peak of your fabulousness. Instead of dealing in units (which is absolutely pointless, and not a proper measurement), deal in fabulousness. If you have been fabulous, and start to think that you might not be as fabulous any more, then stop. Drink until the peak of your fabulousness! It’s always good to have a palate cleanser of water occasionally, even if it isn’t very jolly. How to deal with a bad drunk at a party. Make sure that they get home safely. The next day, when they phone you in a completely mortified fashion, you must deny that they were anything other than divine company. They will be beating themselves up anyway, unable to come out from under the duvet, so as a host, it is terribly rude to tell someone that they were not properly behaved. You would not have invited them if they were not people that you wanted to be around, so treat them as such. Don’t look for problems, look for solutions. If someone turns up late it is probably because they work in a different industry to you, and are stuck at work. I am hugely forgiving if anyone is late, because they are never deliberately trying to mess up your plans. So just leave the oven on, and feed them when they get there. Be flexible. I am always encouraging people to be happy. If people feel so happy that they want to dance on the tables or swing from the chandeliers, then that they should do. I will always say – Do that. Absolutely, please do that. I really do want people to have a wonderful time. Flirting. Flirting should just be to the point that people are complimented rather than anything sleazy or untoward, or indicating anything improper. Keep a paint pot at the ready. Don’t be stuffy. If you serve red wine, you have to imagine that it’s going to be spilt. Instead of trying to wipe spillages off the walls, just always keep a pot of paint ready, and just repaint it the next day – no problem. These are things that really don’t matter. They are part of the journey. Make fake cocktails for drunk people. I make my fake ‘Pink Gin’, which I press into the hands of people who are a bit too drunk, to help them out. It’s a fake cocktail. It’s just tonic water with a few drops of Angostura bitters, some ice and some lime and lemon. If they really are too drunk, then I simply order them a cab, and say ‘Oh! Your cab is here!’. If you need help, it’s fine to ask your closest friends. We all offer to help in the kitchen, but quite often it can be more of a hindrance than a help. One should never feel compelled to offer to wash the dishes, unless you are staying the night in their house, in which case you must offer. I would always rather that my guests to end their party by dancing on the tables, not in the sink! It goes without saying that all the rules are brilliant. But I remember thinking that it was such a good idea to serve a deconstructed roast dinner. Since then, I have had a drinks party and served little bowls of roast potatoes and they went down brilliantly. Don’t even bother with cocktail sticks, because it’s a pain being stuck with one in your hand. I think that it’s best to cut the potatoes really small, so that you get maximum crispiness. 1. Preheat the oven to 200C. Put some baking paper on a baking tray, stab the aubergines a few times with a sharp knife and put it in the oven. Lay the table and pour yourself a glass of wine. In 20-25 minutes, check to see how they’re getting on – you want them to have collapsed completely. Then, take them out, leave them to cool a bit and scrape the inside of the flesh into a bowl. Don’t scrape the skins too hard because otherwise it’ll become bitter. You can then drizzle a tiny bit of olive oil on the leftover skins, salt and pepper, and put them back into the oven for 10 minutes until crispy, as a special chef’s snack. 2. Crush a couple of cloves of garlic, and mix them in with the aubergine flesh, along with the juice of half a lemon, a small glug of olive oil, a couple of big spoonfuls of Greek yoghurt, and a tub of houmous. 3. Toast some pine nuts until golden brown, and toast some pittas – wholemeal or white. Top the dip with pomegranate seeds, toasted pine nuts and torn up mint.